The project responds simultaneously to the physical conditions of the Jerusalem landscape and the gentle slope overlooking east, as well as to new ideas on the contemporary campus. The main concept lies in assembling Bezalel students around a public monumental square, aided by the two axes that reinforce a sense of sharing. 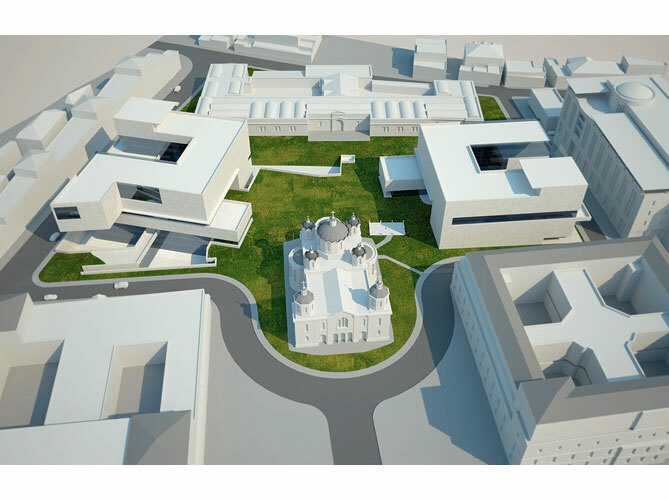 The first axis stretches from the Holy Trinity Cathedral towards east while the other one is between the inner courts of the new buildings. The design seeks to incorporate the program of a contemporary campus, as well as the historical context and the topographical condition of the site. Both situations determine the design of a vertically oriented urban campus. Therefore, the architectural strategy embraces the notion of "highness" to organize the hybrid program of Bezalel in a vertical direction at the topographically privileged site of the 'Russian Compound'. The program distributes one use on top of another, overlapping the different departments studios as the main volumes within the hybrid structure. Accessibility is a priority in the design of the new campus. Bezalel therefore establishes a net of links with the projected flows of people. In the entrance courts, all flows are brought together on different levels. The closed volumes of the different departments are suspended in the air, yet the open structure gives students and visitors an experience of spaciousness and freedom. The new buildings are nine levels high each, with a plan measuring 45x45 meters. There is the south building which is more public, while the north one houses most of the school private facilities. In the south building – from the entrance, a wide staircase leads down to the library area and exhibition space, or continues further to the auditorium. Some voids rise to the very top of the building. Next to the voids are the main staircases and elevators. These give access to all the departments above and below. The box-shaped structure can accommodate all the different functions, while the students will have in front of them a background view towards east – through large transparent glass windows – stretching wide to meet the horizon. The square and the open balconies are designed to serve as platforms for open-air events. In Jerusalem, building regulations require 60 percent of the facade to be dressed Jerusalem stone, while the study spaces for students and researchers require openness. The design seeks to reconcile such a paradoxical requirement in an ingenious manner. The proposal transforms the site of the 'Russian Compound', with all its historic meaning into an urban landmark. By creating a public square as part of the design, the project aims to expose the art school, the students and the site to the public and vice versa. The Cathedral, along with the facilities which surround the square, which are the exhibition galleries, canteen, yards of workshops and lobbies which easily lead to the library and auditorium, create a sense of sharing between Bezalel and the public.